Sandalmere Cottage is a beautifully restored turn of the century stone cottage. 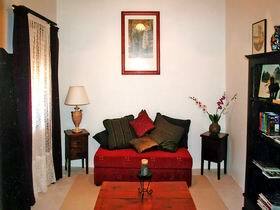 It is set amongst Sandalwood trees and rolling horse fields. Sandalmere sleeps up to six people with one queen bed, two double beds and provisions for two extra people if required. This lovely old stone cottage has a friendly ambience with full kitchen facilities, exposed wooden beams, slate floors, rendered walls and picture windows. Sit and relax by the wood fire and watch the horses come down to the water and the birds cavort around the garden. End the day in a relaxing bubble bath with a glass of wine. Then watch one of the many DVD's supplied. 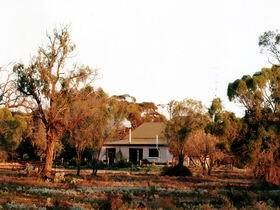 Sandalmere is an experience not to be missed and is close to all Riverland experiences and only minutes from the River Murray and popular Hogwash Bend picnic and swimming area.